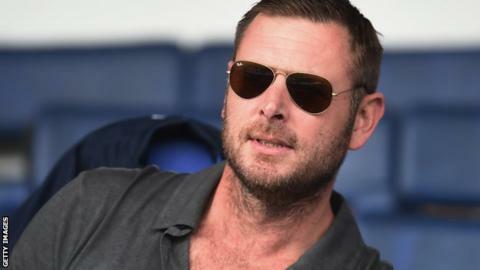 Peterborough United owner Darragh MacAnthony has joked his wife thinks he is having an affair with boss Graham Westley because of how much they talk. Westley has lifted League One Posh to seventh since taking over in September. "My missus thinks I'm having an affair with him, because we speak so much," he told BBC Radio Cambridgeshire. "I've never known a manager who wants to speak to me as much as him. We went out last week for dinner. I love his intensity and he loves my intensity." He added: "He lives every day like it's his last, it's incredible. "The energy he's got - he'll send me pictures of himself in the gym at 10 o'clock at night, saying 'right I'm off out for dinner now'. "He's got everyone at the football club on his wavelength, the fact that you have to work hard and be together to be successful. Everyone has bought into that and rightly so. "If I have to get my wellies on and shovel stuff, I'll do it for this guy." Former Stevenage manager Westley took over an 18th-placed Posh from Dave Robertson, the ex-caretaker manager who was sacked despite signing a three-year deal in May. And MacAnthony admitted he made a mistake not to speak to Westley when searching for a new manager during the summer. "He wanted to see me in May. Me being lazy, I didn't see him. After he finished with Stevenage, he contacted (director of football) Barry Fry. He wanted to speak to me. (It was) a mistake on my part and I admit to that now," MacAnthony continued. "When the job became available there were a lot of people trying to get in contact with me. I was in America and, because I wasn't well, I wasn't travelling back to England, so people had to come and see me. "He basically did everything in his power to get in front of me. He bought his own ticket to America. I like that. I really loved the fact that he was really pulling out all the stops to get the job. He flew in on the Sunday and he flew home on the Monday night - it was incredible. "He's relentless. He's motivated, hungry. Because things have happened in his career, he's got a good chip on his shoulder. "Me telling him the way I want us to play and the style of play and what our football club is famous for, it has opened his eyes. "I do nothing but give him backing and we do very well together. This guy is something special. "Everyone at the club is enjoying working with the manager. He is a real joy to work with every day." "I'm feeling like a different man. I had an operation, had them sorted out. I lost about 14 pounds. "I wouldn't wish it on my worst enemy. At the end of August I thought I was dying. I was in a bad way." Peterborough have won five of their last six matches, and scored 39 goals in their last 14 matches in all competitions, 2.78 goals per game. "It has been a joy to watch. Everything is very good and we're in a very good place. "All good football clubs go through periods when it doesn't go your way. We had a sticky period there for a year or so where everything we're famous for didn't happen. "It wasn't good. I've got to be honest, I started questioning my own recruitment policy at the club. I've always been a firm believer - we've got a very, very healthy young group of players. "I guess we're seeing some of that. It's nice and long may it continue." "I'm loving it again. I'm not going to lie - there was a period there when I felt I wasn't loving it. It was a serious strain on me. I always bought a football club to enjoy owning a football club. "But no, I'm not interested in talking to people. It's not up for sale. "There were approaches in the summer. It wasn't right for me, it wasn't right for the football club itself and the community. I'm very happy where I am. MacAnthony was close to signing Jamie Vardy when the now-England international was at Fleetwood before Leicester stepped in. And Irishman MacAnthony believes Posh, who brought ex-Scotland international Craig Mackail-Smith out of non-league, are respected for their lower-level knowledge. "I exploded the non-league scene, as seen with the Jamie Vardy transfer," he said. "Because of the recruitment we did earlier on, that led to a lot of people taking punts from bigger clubs, such as Leicester, spending that kind of money. "When Peterborough come knocking now for a non-league talent, what usually happens is, while I try and negotiate a price with a chairman, he will leak it to the press, let everyone else know, and you'll have every other club (interested), and we can't match the wages of some of those clubs."